For the specific manifestation of the canonical hours in the public prayer of the Roman rite of the Catholic Church, see Liturgy of the Hours. The practice of daily prayers grew from the Jewish practice of reciting prayers at set times of the day known as zmanim: for example, in the Acts of the Apostles, Saint Peter and John the Evangelist visit the Temple in Jerusalem for the afternoon prayers. Psalm 119:164 states: "Seven times a day I praise you for your righteous laws" (of this, Symeon of Thessalonica writes that "the times of prayer and the services are seven in number, like the number of gifts of the Spirit, since the holy prayers are from the Spirit"). This practice is believed to have been passed down through the centuries from the Apostles, with different practices developing in different places. As Christian monasticism spread, the practice of specified hours and liturgical formats began to develop and become standardized. Around the year 484, the Greek-Cappadocian monk Sabbas the Sanctified began the process of recording the liturgical practices around Jerusalem, while the cathedral and parish rites in the Patriarchate of Constantinople evolved in an entirely different manner. In 525, Benedict of Nursia set out one of the earliest schemes for the recitation of the Psalter at the Office. The two major practices were synthesized, commencing in the 8th century, to yield an office of great complexity. 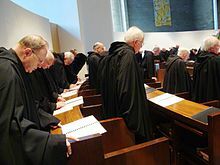 The Cluniac Reforms of the 11th century renewed an emphasis on liturgy and the canonical hours in the reformed priories of the Order of Saint Benedict, with Cluny Abbey at their head. In the Catholic Church, canonical hours are also called offices, since they refer to the official set of prayers of the Church, which is known variously as the officium divinum ("divine service" or "divine duty"), and the opus Dei ("work of God"). The current official version of the hours in the Roman Rite of the Catholic Church is called the Liturgy of the Hours (Latin: liturgia horarum) in North America or divine office in Ireland and Britain. In Anglicanism, they are often known as the daily or divine office, to distinguish them from the other 'offices' of the Church (holy communion, baptism, etc.). In the Eastern Orthodox Church and Eastern Catholic Churches, the canonical hours may be referred to as the divine services, and the book of hours is called the horologion (Greek: ῾Ωρολόγιον). Despite numerous small differences in practice according to local custom, the overall order is the same among Byzantine Rite monasteries, although parish and cathedral customs vary rather more so by locale. The usage in Oriental Orthodoxy, the Assyrian Church of the East, and the Eastern Catholic counterparts all differ from each other and from other rites. Already well-established by the 9th century in the West, these canonical offices consisted of seven daily prayer events, including lauds, prime, terce, sext, none, vespers, and compline, as well as the night office, sometimes referred to as vigils, consisting of a number of sections called 'nocturnes'. Building on the recitation of psalms and canticles from scripture, the Church has added (and, at times, subtracted) hymns, hagiographical readings, and other prayers. The canonical hours stemmed from Jewish prayer. In the Old Testament, God commanded the Israelite priests to offer sacrifices of animals in the morning and evening (Exodus 29:38–39). Eventually, these sacrifices moved from the Tabernacle to Solomon's Temple in Jerusalem. During the Babylonian captivity, when the Temple was no longer in use, the first synagogues were established, and the services (at fixed hours of the day) of Torah readings, psalms, and hymns began to evolve. This "sacrifice of praise" began to be substituted for the sacrifices of animals. After the people returned to Judea, the prayer services were incorporated into Temple worship as well. As time passed, the Jews began to be scattered across the Greco-Roman world in what is known as the Jewish diaspora. By the time of the Roman Empire, the Jews (and eventually early Christians) began to follow the Roman system of conducting the business day in scheduling their times for prayer. In Roman cities, the bell in the forum rang the beginning of the business day at about six o'clock in the morning (Prime, the "first hour"), noted the day's progress by striking again at about nine o'clock in the morning (Terce, the "third hour"), tolled for the lunch break at noon (Sext, the "sixth hour"), called the people back to work again at about three o'clock in the afternoon (Nones, the "ninth hour"), and rang the close of the business day at about six o'clock in the evening (the time for evening prayer). Now when the sixth hour had come, there was darkness over the whole land until the ninth hour. And at the ninth hour Jesus cried out with a loud voice ... and breathed His last. The first miracle of the apostles, the healing of the crippled man on the temple steps, occurred because Saint Peter and John the Apostle went to the Temple to pray (Acts 3:1). Also, one of the defining moments of the early Church, the decision to include Gentiles among the community of believers, arose from a vision Peter had while praying at noontime (Acts 10:9–49). As Christianity began to separate from Judaism, the practice of praying at fixed times continued. The early church was known to pray the Psalms (Acts 4:23–30), which have remained the principal part of the canonical hours. By 60 AD, the Didache, the oldest known liturgical manual for Christians, recommended disciples to pray the Lord's Prayer three times a day; this practice found its way into the canonical hours as well. Pliny the Younger (63 – c. 113), who was not a Christian himself, mentions not only fixed times of prayer by believers, but also specific services—other than the Eucharist—assigned to those times: "they met on a stated day before it was light, and addressed a form of prayer to Christ, as to a divinity ... after which it was their custom to separate, and then reassemble, to eat in common a harmless meal." By the second and third centuries, such Church Fathers as Clement of Alexandria, Origen, and Tertullian wrote of the practice of Morning and Evening Prayer, and of the prayers at the third, sixth and ninth hours. The prayers could be prayed individually or in groups. As the form of fixed-hour prayer developed in the Christian monastic communities in the East and West, the Offices grew both more elaborate and more complex, but the basic cycle of prayer still provided the structure for daily life in monasteries. By the fourth century, the elements of the canonical hours were more or less established. For secular (non-monastic) clergy and lay people, the fixed-hour prayers were by necessity much shorter, though in many churches, the form of the fixed-hour prayers became a hybrid of secular and monastic practice (sometimes referred to as 'cathedral' and 'monastic' models). In the East, the development of the Divine Services shifted from the area around Jerusalem to Constantinople. In particular, Theodore the Studite (c. 758 – c. 826) combined a number of influences from the Byzantine court ritual with monastic practices common in Anatolia, and added thereto a number of hymns composed by himself and his brother Joseph (see typikon for further details). In the West, the Rule of Saint Benedict was modeled his guidelines for the prayers on the customs of the basilicas of Rome. It was he who expounded the concept in Christian prayer of the inseparability of the spiritual life from the physical life. St. Benedict set down the dictum Ora et labora – "Pray and work". The Order of Saint Benedict began to call the prayers the Opus Dei or "Work of God." The fixed-hour prayers came to be known as the "Divine Office" (office coming from the Latin word for duty). As the Divine Office grew more important in the life of the Church, the rituals became more elaborate. Praying the Office already required various books, such as a Psalter for the psalms, a lectionary to find the assigned Scripture reading for the day, a Bible to proclaim the reading, a hymnal for singing, etc. As parishes grew in the Middle Ages away from cathedrals and basilicas, a more concise way of arranging the hours was needed. So, a sort of list developed called the breviary, which gave the format of the daily office and the texts to be used. The spread of breviaries eventually reached Rome, where Pope Innocent III extended their use to the Roman Curia. The Franciscans sought a one-volume breviary for their friars to use during travels, so the order adopted the Breviarium Curiae, but substituting the Gallican Rite Psalter for the Roman. The Franciscans gradually spread this breviary throughout Europe. Eventually, Pope Nicholas III adopted the widely used Franciscan breviary to be the breviary used in Rome. By the 14th century, the breviary contained the entire text of the canonical hours. The Council of Trent, in its final session on 4 December 1563, entrusted the reform of the Breviary to the Pope. On 9 July 1568, Pope Pius V, the successor of the Pope who closed the Council of Trent, promulgated an edition, known as the Roman Breviary, with his Apostolic Constitution Quod a nobis, imposing it in the same way in which, two years later, he imposed his Roman Missal and using language very similar to that in the bull Quo primum with which he promulgated the Missal, regarding, for instance, the perpetual force of its provisions, the obligation to use the promulgated text in all places, and the total prohibition of adding or omitting anything, declaring in fact: "No one whosoever is permitted to alter this letter or heedlessly to venture to go contrary to this notice of Our permission, statute, ordinance, command, precept, grant, indult declaration, will decree and prohibition. Should anyone, however, presume to commit such an act, he should know that he will incur the wrath of Almighty God and of the Blessed Apostles Peter and Paul." Later Popes altered the Roman Breviary of Pope Pius V. Pope Clement VIII made changes that he made obligatory on 10 May 1602, 34 years after Pius V's revision. Pope Urban VIII made further changes, including "a profound alteration in the character of some of the hymns. Although some of them without doubt gained in literary style, nevertheless, to the regret of many, they also lost something of their old charm of simplicity and fervour." For the profound revision of the book by Pope Pius X see Reform of the Roman Breviary by Pope Pius X.
Pope Pius XII also began reforming the Roman Breviary, allowing use of a new translation of the Psalms and establishing a special commission to study a general revision, with a view to which all the Catholic bishops were consulted in 1955. His successor, Pope John XXIII, made a further revision in 1960. Following the Second Vatican Council, the Catholic Church's Roman Rite simplified the observance of the canonical hours and sought to make them more suited to the needs of today's apostolate and accessible to the laity, hoping to restore their character as the prayer of the entire Church. The Council itself abolished the office of Prime, and envisioned a manner of distributing the psalms over a period of more than 1 week. In the succeeding revision, the character of Matins was changed to an Office of Readings so that it could be used at any time of the day as an office of Scriptural and hagiographical readings. Furthermore, the period over which the entire Psalter is recited has been expanded from one week to four. Since 1985, with the publication of the second typical edition of the Latin liturgical books, the Latin hymns of the Roman Office were once again restored to their pre-Urban revision. The Roman breviary is now published under the title Liturgia Horarum. A translation is published by Catholic Book Publishing Corp. under the title The Liturgy of the Hours in four volumes, arranged according to the liturgical seasons of the Church year. The current liturgical books for the celebration of the Hours in Latin are those of the editio typica altera (second typical edition) promulgated in 1985. The official title is Officium Divinum, Liturgia Horarum iuxta Ritum Romanum, editio typica altera. Two English translations are in use. Volume III: Weeks of the Year (6–34). The psalms are taken from the 1963 Grail Psalms, while the Scriptural readings and canticles are taken from various versions of the Bible, including the Revised Standard Version, the Jerusalem Bible, the Knox Bible, the Good News Bible, and the New English Bible. Between 2005 and 2006, Collins republished The Divine Office and its various shorter editions with a new cover. Catholic Truth Society published Prayer During the Day in 2009. The Liturgy of the Hours is translated by the International Commission on English in the Liturgy (ICEL). First published in 1975 by Catholic Book Publishing Company in the US, this edition is the official English edition for use in the US, Canada and several other English-speaking dioceses. This title comes complete in four volumes in an arrangement identical to the original Latin typical edition. The psalms are taken mainly from the 1963 Grail Psalms, while the Scriptural readings and canticles are taken from the New American Bible. Shorter editions of the Liturgy of the Hours are also available from various publishers: Christian Prayer (Daughters of St Paul and Catholic Book Publishing Company), Shorter Christian Prayer (Catholic Book Publishing Company only) and Daytime Prayer (Catholic Book Publishing Company). In 2007, Liturgy Training Publications released the new Mundelein Psalter, which provided the complete Morning, Evening and Night Prayers from ICEL's translation set to chant tones. Both these editions are based on the Latin 1971 editio typica. Priests are required by canon law to pray the entire Divine Office each day while permanent deacons are required to pray the morning and evening hours. All clerics are free to use the Liturgy of the Hours or the traditional Roman Breviary, according to the motu proprio Summorum Pontificum, to fulfill this obligation. The practice among religious communities varies according to their rules and constitutions. The Second Vatican Council also exhorted the Christian laity to take up the practice, and as a result, many lay people have begun reciting portions of the Liturgy of the Hours. Invitatory (not an hour properly called, but the introduction to the first hour said on the current day, whether it be the Office of Readings or Morning Prayer). In addition to the distribution of almost the whole Psalter over a four-week cycle, the Church also provides appropriate hymns, readings, psalms, canticles and antiphons, for use in marking specific celebrations in the Roman Calendar, which sets out the order for the liturgical year. These selections are found in the 'Proper of Seasons' (for Advent, Christmas, Lent and Easter), and the 'Proper of Saints' (for feast days of the Saints). 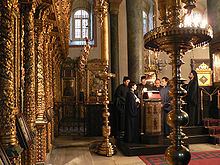 Two main strata exist in the rite, those places that have inherited the traditions of the Russian Church which had been given only the monastic Sabbaite typicon which she uses to this day in parishes and cathedrals as well as in monasteries, and everywhere else where some remnant of the cathedral rite remained in use; therefore, the rite as practiced in monasteries everywhere resembles the Russian recension, while non-Russian non-monastic customs differs significantly. For example, in the Russian tradition, the "all-night vigil" is served in every church on Saturday nights and the eves of feast days (all though it may be abridged to be as short as two hours) while elsewhere, it is usual to have Matins on the morning of the feast; however, in the latter instance, Vespers and matins are rather less abridged but the Divine Liturgy commences at the end of matins and the hours are not read, as was the case in the extinct cathedral rite of Constantinople. The Horologion (῾Ωρολόγιον; Church Slavonic: Chasoslov, Часocлoвъ), or Book of Hours, provides the fixed portions of the Daily Cycle of services (Greek: akolouthies, ἀκολουθίες) as used by the Eastern Orthodox and Eastern Catholic churches. Psalter (Greek: Ψαλτήρ(ιον), Psalter(ion); Slavonic: Ѱалтырь or Ѱалтирь, Psaltyr' ) A book containing the 150 Psalms[note 1] divided into 20 sections called Kathismata together with the nine Biblical canticles which are chanted at Matins; although these canticles had been chanted in their entirety, having over time come to be supplemented by interspersed hymns (analogously to stichera) to form the Canon, the canticles themselves are now only regularly used in a few large monasteries. [note 2] The Psalter also contains the various "selected psalms", each composed of verses from a variety of psalms, sung at matins on feast days, as well as tables for determining which Kathismata are to be read at each service; in addition to the Psalms read at the daily offices, all the Psalms are read each week and, during Great Lent, twice a week. Octoechos (Greek: Ὀκτώηχος; Slavonic: Октоихъ, Oktoikh or Осмогласникъ, Osmoglasnik)—Literally, the Book of the "Eight Tones" or modes. This book contains a cycle of eight weeks, one for each of the eight echoi (church modes of the Byzantine musical system of eight modes), providing texts for each day of the week for Vespers, Matins, Compline, and (on Sundays) the Midnight Office. The origins of this book go back to compositions by St. John Damascene. Menaion (Greek: Μηναίον; Slavonic: Минеѧ, Mineya)—A twelve-volume set which provides liturgical texts for each day of the calendar year,[note 3] printed as 12 volumes, one for each month of the year. [note 4] Another volume, the General Menaion contains propers for each class of saints for use when the propers for a particular saint are not available. Additionally, locally venerated saints may have services in supplemental volumes, pamphlets, or manuscripts. Menologion A collection of the lives of the saints and commentaries on the meaning of feasts for each day of the calendar year, also printed as 12 volumes,[note 4] appointed to be read at the meal in monasteries and, when there is an all-night vigil for a feast day, between Vespers and Matins. Irmologion (Greek: ῾Ειρμολόγιον; Slavonic: Ирмологий, Irmologii)—Contains the Irmoi chanted at the Canon of Matins and other services. Patristic writings Many writings from the Church fathers are prescribed to be read at matins and, during great lent, at the hours; in practice, this is only done in some monasteries and frequently therein the abbot prescribes readings other than those in the written rubrics. therefore it is not customary to enumerate all the volumes required for this. Collections (Greek: Ανθολόγιον, Anthologion; Slavonic: Сборникъ, Sbornik) There are numerous smaller anthologies available[note 7] which were quite common before the invention of printing but still are in common use both because of the enormous volume of a full set of liturgical texts and because the full texts have not yet been translated into several languages currently in use. Prote Ora (Πρῶτη Ὥρα) First Hour (Prime) At ~6 AM Christ's being brought before Pilate. Typica (τυπικά) or Pro-Liturgy Typica follows sixth or ninth hour . The Typica is served whenever the Divine Liturgy is not celebrated at its usual time, i.e., when there is a vesperal Liturgy or no Liturgy at all. On days when the Liturgy may be celebrated at its usual hour, the Typica follows the sixth hour (or Matins, where the custom is to serve the Liturgy then) and the Epistle and Gospel readings for the day are read therein;[note 11] otherwise, on aliturgical days or when the Liturgy is served at vespers, the Typica has a much shorter form and is served between the ninth hour and vespers. The full cycle of services are usually served only in monasteries, cathedrals, and other katholika. In monasteries and parishes of the Russian tradition, the Third and Sixth Hours are read during the Prothesis ( Liturgy of Preparation); otherwise, the Prothesis is served during Matins, the final portion of which is omitted, the Liturgy of the Catechumens commencing straightway after the troparion following the Great Doxology. "Midnight Praise" (said in the early morning before dawn) commemorates the Second Coming of Christ. It consists of three watches, corresponding to the three stages of Christ's prayer in the Garden of Gethsemane ( Matthew 25:1–13 ). The East Syriac Rite (also known as the Chaldean, Assyrian, or Persian Rite) has historically been used in Syria, Mesopotamia, Persia, and Malabar. The nucleus of the Daily Office is of course the recitation of the Psalter. There are only three regular hours of service (Evening, Midnight, and Morning), with a rarely used Compline. When East Syriac monasteries existed (which is no longer the case) seven hours of prayer were the custom in them, and three hulali (sections) of the Psalter were recited at each service. This would accomplish the unique feat of the common recitation of the entire Psalter each day. The present arrangement provides for seven hulali at each ferial night service, ten on Sundays, three on "Memorials", and the whole Psalter on Feasts of the Lord. At the evening service there is a selection of from four to seven psalms, varying with the day of the week, and also a Shuraya, or short psalm, with generally a portion of Psalm 118, varying with the day of the fortnight. At the morning service the invariable psalms are 109, 90, 103:1–6, 112, 92, 148, 150, 116. On ferias and "Memorials" Psalm 146 is said after Psalm 148, and on ferias Psalm 1:1–18, comes at the end of the psalms. The rest of the services consist of prayers, antiphons, litanies, and verses (giyura) inserted—like the Greek stichera, but more extensively—between verses of psalms. On Sundays the Gloria in Excelsis and Benedicte are said instead of Psalm 146. Both morning and evening services end with several prayers, a blessing, (Khuthama, "Sealing" ), the kiss of peace, and the Creed. The variables, besides the psalms, are those of the feast or day, which are very few, and those of the day of the fortnight. These fortnights consist of weeks called "Before" (Qdham) and "After" (Wathar), according to which of the two choirs begins the service. Hence the book of the Divine Office is called Qdham u wathar, or at full length Kthawa daqdham wadhwathar, the "Book of Before and After". The East Syriac liturgical Calendar is unique. The year is divided into periods of about seven weeks each, called Shawu'i; these are Advent (called Subara, "Annunciation"), Epiphany, Lent, Easter, the Apostles, Summer, "Elias and the Cross", "Moses", and the "Dedication" (Qudash idta). "Moses" and the "Dedication" have only four weeks each. The Sundays are generally named after the Shawu'a in which they occur, "Fourth Sunday of Epiphany", "Second Sunday of the Annunciation ", etc., though sometimes the name changes in the middle of a Shawu'a. Most of the "Memorials" (dukhrani), or saints' days, which have special lections, occur on the Fridays between Christmas and Lent, and are therefore movable feasts; but some, such as Christmas, Theophany, the Dormition, and about thirty smaller days without proper readings, are on fixed days. The Fast of the Ninevites commemorates the repentance of Nineveh at the preaching of Jonas, and is carefully kept. Those of Mar Zaya and the Virgins are nearly obsolete. The Malabar Rite has largely adopted the Roman Calendar, and several Roman days have been added to that of the Chaldean Catholics. The Chaldean Easter coincides with that of the Eastern Orthodox Church, as the Julian Calendar is used to calculate Easter. The years are numbered, not from the birth of Christ, but from the Seleucid era (year 1 = 311 B.C.). The West Syriac Rite, used in Syria by the Syriac Orthodox (Jacobites) and Syriac Rite Catholic is in its origin simply the old rite of Antioch in the Syriac language. The translation must have been made very early, evidently before the division in the church over Chalcedon, before the influence of Constantinople over the Antiochian Rite had begun. No doubt as soon as Christian communities arose in the rural areas of Syria the prayers which in the cities (Antioch, Jerusalem, etc.) were said in Greek, were, as a matter of course, translated into Syriac for common use. The Midnight prayer (Matins) consists of three qawme or "watches" (literally "standings"). As in other traditional rites, the ecclesiastical day begins in the evening at sunset with Vespers (Ramsho). Today, even in monasteries, the services are grouped together: Vespers and Compline are said together; Matins and Prime are said together; and the Third, Sixth and Ninth Hours are said together; resulting in three times of prayer each day. The Syriac Orthodox Book of Hours is called the Shhimo, "simple prayer." The shhimo has offices for the canonical hours for each day of the week. Each canonical office begins and ends with a qawmo, a set of prayers that includes the Lord's Prayer. At the end of the office, the Nicene Creed is recited. The great part of the office consists of lengthy liturgical poems composed for the purpose, similar to the Byzantine odes. The Daily Services in the Armenian Apostolic Church and the Armenian Catholic Church are made up of nine services. The daily cycle of prayer begins with the Night Service, according to the ancient belief that a new day begins at nightfall. The Night Service (midnight) Dedicated to the praising of God the Father. Themes of the service are: thanksgiving to God for the blessing of sleep and asking that the remainder of the night pass in peace and tranquility, and that the next day be spent in purity and righteousness. The Morning Service (dawn) Dedicated to the praising of God the Son. Symbolizes the Resurrection of Christ and his appearance to the Myrrh-bearing Women. The Sunrise Service (6:00 a.m.)[note 18] Dedicated to the praising of the Holy Spirit. Symbolizes the appearance to Christ to the disciples after the Resurrection. The Third Hour (9:00 a.m.) Dedicated to the Holy Spirit. Symbolizes Eve’s original tasting the forbidden fruit and eventual liberation from condemnation through Jesus Christ. The service has a profound penitential meaning. The Sixth Hour (noon) Dedicated to God the Father. Symbolizes Christ's Crucifixion. The prayers at the service ask for God's help towards feeble human nature. The Ninth Hour (3:00 p.m.) Dedicated to God the Son. Symbolizes Christ's death and liberation of humanity from the power of the Hell. The Evening Service (before sunset) Dedicated to God the Son. Symbolizes Christ's burial, asks God for a quiet night and a peaceful sleep. The Peace Service (after sunset) Dedicated to the Holy Spirit. Symbolizes Christ's descent into Hell and liberation of the righteous from torments. The Rest Service (before retiring for sleep) Dedicated to God the Father. In early times it was the continuation of the Peace Service. The book which contains the hymns which constitute the substance of the musical system of Armenian liturgical chant is the Sharagnots (see Armenian Octoechos), a collection of hymns known as Sharakan. Originally, these hymns were Psalms and biblical Canticles that were chanted during the services, similar to the Byzantine Canon. In addition, the eight modes are applied to the psalms of the Night office, called ganonaklookh (Canon head). The Book of Common Prayer, first published in 1549 and revised down the centuries, constitutes the basis of the liturgy for Anglicans and Anglican Use Roman Catholics. All Anglican prayer books provide offices for Morning Prayer (often called Mattins or Matins) and Evening Prayer (colloquially known as Evensong). Some prayer books also include a selection of prayers and devotions specifically for family use. The 1979 Book of Common Prayer of the Episcopal Church in the U.S. also provides an "Order of Worship for the Evening" as a prelude to Evensong with blessings for the lighting of candles and the singing of the ancient Greek lamp-lighting hymn, the Phos Hilaron. In the Church of England, the publication in 2005 of Daily Prayer, the third volume of Common Worship, adds "Prayer During the Day" to the services for Morning Prayer, Evening Prayer and Compline, and adds a selection of antiphons and responsories for the seasons of the Church Year. The 1989 New Zealand Prayer Book provides different outlines for Mattins and Evensong on each day of the week, as well as "Midday Prayer," "Night Prayer," and "Family Prayer." In 1995, the Episcopal Church (United States) published the Contemporary Office Book in one volume with the complete psalter and all readings from the two-year Daily Office lectionary. The traditional structure of Matins and Evensong in most Anglican prayer books reflects the intention by the reforming Archbishop of Canterbury, Thomas Cranmer, to return to the office's older roots as the daily prayer of parish churches. For this purpose, he eliminated the lesser hours and conflated the medieval offices of Matins and Lauds, incorporating the canticles associated with each: the Benedictus and Te Deum. Similarly, Evening Prayer incorporated both the Magnificat from Vespers and the Nunc Dimittis from Compline. In Cranmer's design, each canticle was preceded by a reading from scripture. This parallelism of two readings, each followed by a canticle, is a distinctive feature of the Anglican daily office. For the sake of simplicity, Cranmer also eliminated responsories and antiphons, although these have been restored in many contemporary Anglican prayer books. Like many other Reformers, Cranmer sought to restore the daily reading or singing of psalms as the heart of Christian daily prayer. Since his time, every edition of the Book of Common Prayer has included the complete psalter, usually arranged to be read over the course of a month. One distinctive contribution of Anglican worship is a broad repertory of Anglican Chant settings for the psalms and canticles. The daily offices have always had an important place in Anglican spirituality. Until comparatively recently Mattins and Evensong were the principal Sunday services in most Anglican churches, sung to settings by composers both ancient and modern. While Evensong with its musical repertory spanning five centuries continues to play an important role in Anglican worship, the eucharist has replaced Morning Prayer as the principal service on Sunday mornings in most Anglican parishes and cathedrals. Most Anglican monastic communities use a Daily Office based on the Book of Common Prayer or on Common Worship but with additional antiphons and devotions. The Order of the Holy Cross and Order of St. Helena published A Monastic Breviary (Wilton, Conn.: Morehouse-Barlow) in 1976. The Order of St. Helena published the St. Helena Breviary (New York: Church Publishing) in 2006 with a revised psalter eliminating male pronouns in reference to God. The All Saints Sisters of the Poor also use an elaborated version of the Anglican Daily Office. The Society of St. Francis publishes Celebrating Common Prayer, which has become especially popular for use among Anglicans. Some Anglo-Catholics use the Anglican Breviary, an adaptation of the Pre-Vatican II Roman Rite and the Sarum Rite in the style of Cranmer's original Book of Common Prayer, along with supplemental material from other western sources, including a common of Octaves, a common of Holy Women, and other material. It provides for the eight historical offices in one volume, but does not include the Little Office of the Blessed Virgin Mary, which was bound along with many editions of the Breviarium Romanum. Other Anglo-Catholics use the Roman Catholic Liturgy of the Hours (US) or Divine Office (UK). Various Anglican adaptations of pre-Vatican II Roman office-books have appeared over the years, among the best known being Canon W. Douglas' translation of the 'Monastic Diurnal' into the idiom of the 'Book of Common Prayer'. Former Anglicans worshiping in Roman Catholic parishes of the Pastoral Provision and the Personal Ordinariates maintain the Anglican flavor of the Daily Office using the Book of Divine Worship, an adaptation of the 1979 Book of Common Prayer approved for Anglican Use Catholics in 2003. Historically, Anglican clergy have vested in cassock, surplice and tippet for Morning and Evening Prayer, while bishops wear the rochet and chimere. In some monastic communities and Anglo-Catholic parishes, the officiant wears surplice or alb, stole and cope when Evensong is celebrated solemnly. The canons of the Church of England and some other Anglican provinces require clergy to read Morning and Evening Prayer daily, either in public worship or privately. According to Canon C.24, "Every priest having a cure of souls shall provide that, in the absence of reasonable hindrance, Morning and Evening Prayer daily and on appointed days the Litany shall be said in the church, or one of the churches, of which he is the minister." Canon C.26 stipulates that "Every clerk (cleric) in Holy Orders is under obligation, not being let (prevented) by sickness or some other urgent cause, to say daily the Morning and Evening Prayer...." In other Anglican provinces, the Daily Office is not a canonical obligation but is strongly encouraged. F. W. Macdonald, the biographer of The Rt. Rev. John Fletcher Hurst, stated that Oxford Methodism "with its almost monastic rigors, its living by rule, its canonical hours of prayer, is a fair and noble phase of the many-sided life of the Church of England". The traditional 1784 Methodist Daily Office is contained in The Sunday Service of the Methodists, which was written by John Wesley himself. It was consequently updated in the Book of Offices, published in 1936 in Great Britain, and The United Methodist Book of Worship, published in 1992 in the United States. Some Methodist religious orders publish the Daily Office to be used for that community, for example, The Book of Offices and Services of The Order of Saint Luke contains Morning, Mid-Morning, Noon, Mid-Afternoon, Evening, Compline and Vigil. The Liberal Catholic Church, and many groups in the Liberal Catholic movement, also use a simple version of the Western canonical hours, said with various scripture reading and collects. According to the Liturgy of the Liberal Catholic Church, the Scriptures used are generally limited to the readings of the day, and the complete psalter is not incorporated unless at the discretion of the priest presiding, if as a public service, or of the devotee in private use. The Hours of the Liberal Rite consist of: Lauds, Prime, Sext, Vespers, and Complin. Its recitation is not obligatory on Liberal Catholic priests or faithful, according to current directs from the General Episcopal Synod. A pew edition of the Hours was published in 2002 by St. Alban's Press. However, the Liturgy of the Liberal Catholic Church also includes the Hours for recitation. Some Reformed churches—notably the Presbyterian Church (USA) and the United Church of Christ—have published daily office books adapted from the ancient structure of morning and evening prayer in the Western church, usually revised for the purpose of inclusive language. The New Century Psalter, published in 1999 by The Pilgrim Press, includes an inclusive-language revision of the psalms adapted from the New Revised Standard Version of the Bible with refrains and complete orders for Morning and Evening Prayer. Simple family prayers for morning, evening and the close of day are also provided. Book of Common Worship Daily Prayer, published in 1994 by Westminster John Knox Press, includes the daily offices from The Book of Common Worship of 1993, the liturgy of the Presbyterian Church USA. In addition to Morning and Evening Prayer there is a complete service for Compline. Its psalter—an inclusive-language revision of the psalter from the 1979 American Book of Common Prayer—also includes a collect for each psalm. Antiphons and litanies are provided for the seasons of the church year. Both books are intended for ecumenical use and can be used with any daily lectionary. Lutheran worship books usually include orders for Morning and Evening Prayer as well as Compline. Liturgies published by immigrant Lutheran communities in North America were based at first on the Book of Common Prayer. In recent years, under the impact of the liturgical movement, Lutheran churches have restored the historic form of the Western office. Both Evangelical Lutheran Worship published by the Evangelical Lutheran Church in America and the Evangelical Lutheran Church in Canada as well as the Lutheran Service Book of the Lutheran Church–Missouri Synod provide daily offices along with a complete psalter. ^ On non-leap years, the service for 29 Feb. (St. John Cassian) is chanted at Compline on 28 Feb..
^ a b In Greek editions the Evangélion is laid out in order of the cycle of readings as they occur in the ecclesiastical year, with a section in the back providing the Gospel readings for Matins, Feasts and special occasions. In the Slavic usage, the Evangélion contains the four gospels in canonical order (Matthew, Mark, Luke, John) with annotations in the margin to indicate the beginning and ending of each reading (and an index in the back). ^ Though the Liturgy (and Typica) are not, strictly speaking, a part of the daily cycle of services, their placement is fixed by the Typicon in relation to the daily cycle. ^ Originally, the Sunrise Service was joined to the Morning Service. ^ Breviary in Catholic Encyclopedia. The article also spoke of "blemishes which disfigure this book." ^ Hurst, John Fletcher (1902). The History of Methodism. Eaton & Mains. pp. 310–. ^ Bradshaw, Paul F. (April 2013). New SCM Dictionary of Liturgy and Worship. Hymns Ancient and Modern Ltd. p. 82. ISBN 978-0-334-04932-6. The Church in 1935 approved Divine Worship (versions of morning prayer, other services and numerous collects) and in 1936 authorized the Book of Offices and, bound in with it, the Order for Morning Prayer: both still exhibited connections to the BCP and thus Wesley's orders, though the former showed a willingness to include newly composed prayers and those borrowed from other Free Church sources. The Hypertext Book of Hours – Online edition of Medieval Daily Office.